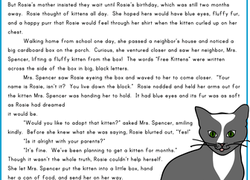 Students will make inferences about the various scenes included in this reading exercise. Guide your students towards understanding what it takes to be a reading detective! By identifying synonyms and looking up definitions, they’ll familiarize themselves with some key vocabulary. Collect and organize your thoughts in preparation for a reading response letter with this graphic organizer. Read this classic story by Rudyard Kipling with your students for basic reading comprehension practice.